I placed the objects form the Pond Collection under the category Build Garden Centre, but actually some of them are found under different categories in the game catalogue. 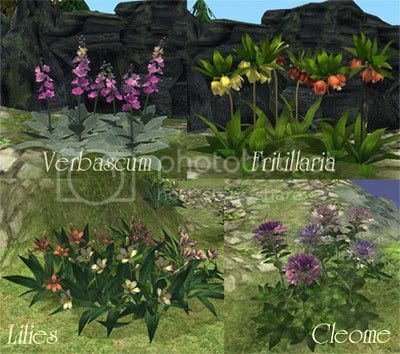 Ground Plants: These are under Decorative Plants in the game catalogue. The Function "Add Soap" has been disabled; Th hippo occupies 4 tiles. 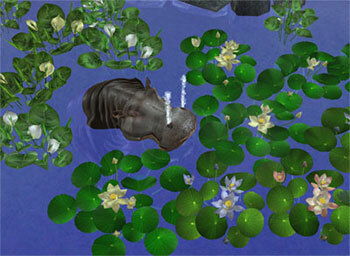 Make sure that you have 4 tiles free so that you can place the hippo on the pond surface without any cheats. You don't need to make the bottom of the pond even. 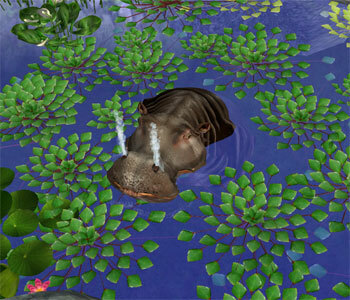 And of course, you can always use the moveobjects on cheat to place the plants nearer the hippo fountain. Known Issues - the waterfalls are bigger than the 4 tiles they occupy. 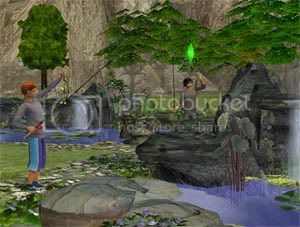 Place them at the edge of the pond or in the water, so that the sims won't pass through them. Features: both are fully animated. They can be placed on the water surface without using any cheats. 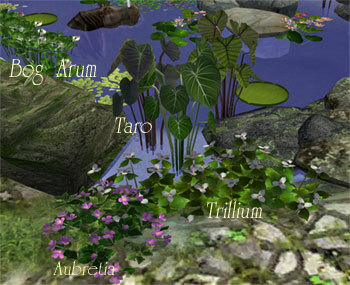 Features - fully animated, designed to be placed on water surfaces or on terrain. 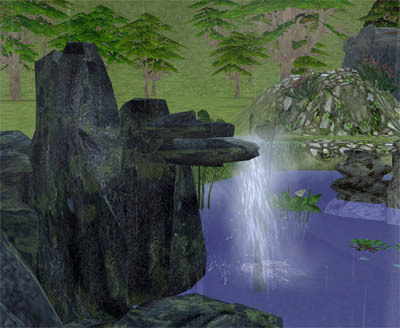 The animation for the waterfall is different from that of the other two, because I had to use only effects from the base game. 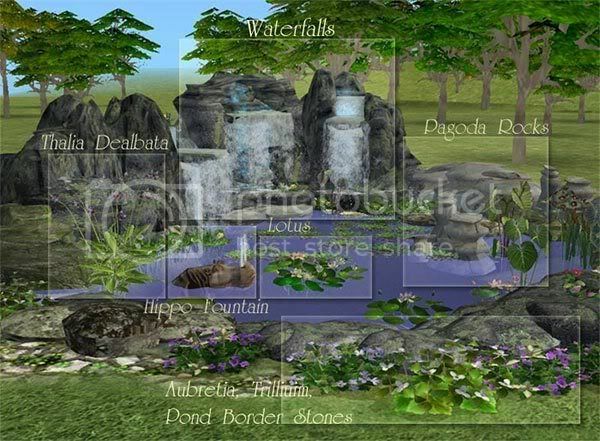 The picture shows an overview of the pond and the waterfalls. As always, feel free to recolour the objects. Please do not upload them to pay sites. Thank you. 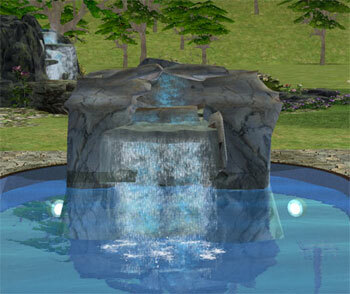 Small update (02.07.07) I added the sound of running water to the Base Game Waterfall for a more realistic effect. The new file is Waterfall BaseGameWithSound.rar. Please note that you cannot have both the old and the new package file in your Downloads folder because they share the same GUIDs. If you decide to have the waterfall with the sound effect, just replace the existing file with the new one, when prompted. 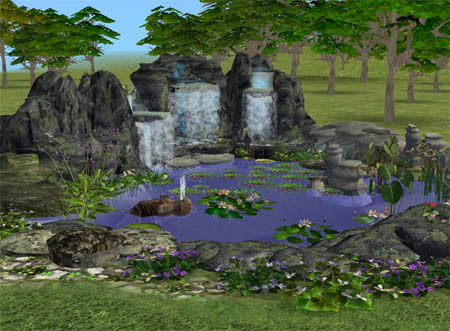 Update 05.07.07 Thanks for telling me about the GUID conflict for the Floating Hippo Fountain and the Pond Border Stones. The files have been replaced with the correct ones. Please replace the older files with the new ones, because the old files overwrite the original Maxis objects. Accept my apologies for the inconvenience.